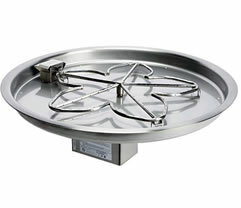 At Fine's Gas we offers three flame control options for our certified outdoor gas fire pit inserts. This is our top-of-the-line system featuring the ignition ease with use of a wall switch or handheld remote to control flame as well as auto-relight if flame loss. This year we are launching a new control system with numerous conveniences and performance improvements for both on/off remote control models and our new Hi/Lo variable flame height remote control models. Start Up: This is done by use of a wall switch or remote control. When the ON command is received, the system completes initial safety checks then starts flow of pilot gas. After 5 seconds the hot surface igniter glows igniting pilot flame. When the system confirms pilot flame present, the main burner gas will flow ignited by the pilot flame. Operation: While enjoying the ambiance of your fire gas pit, the system is at work monitoring flame status, internal temperatures / voltages and other safety parameters. If flame loss does occur, the system will turn off all gas flow and then restart by automatically commencing start sequence. On/Off Remote Control Models: Include the convenience and safety features - optional remote control available. Hi / Lo Variable Flame Remote Control Models: This option includes a smart remote control with 2-way communication with the fire pit. Remote allows flame height control while receiving information from fire pit to advise user of fire pit status (flashing LED). This model also has integrated Bluetooth technology that offers the added convenience of controlling your fire pit with a Droid or Apple device by downloading the app. Shut Down: To turn OFF the fire pit simply use wall switch, remote control or whole house system. 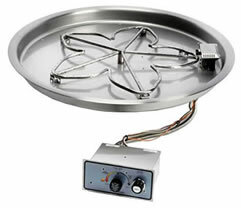 Our mid-range battery powered ignition gas fire pit inserts utilizing safety pilot flame control - simply push ignition button and valve control knob to start and flame adjustment is done with control knob. This battery operated system is a good solution for flame sensing necessity without AC power requirements. Start Up: This is done by simultaneously pressing valve control knob to start flow of pilot gas and pressing ignition button for spark. Release spark after pilot ignition, release valve control knob after about 20 seconds. Then turn valve control knob counterclockwise to light main burner. Shut Down: To turn OFF the fire pit simply turn valve control knob clockwise- slightly depress knob to reach OFF position. 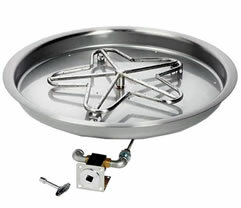 This is our simplest certified gas fire pit insert - easy to operate and requires the least amount of maintenance.